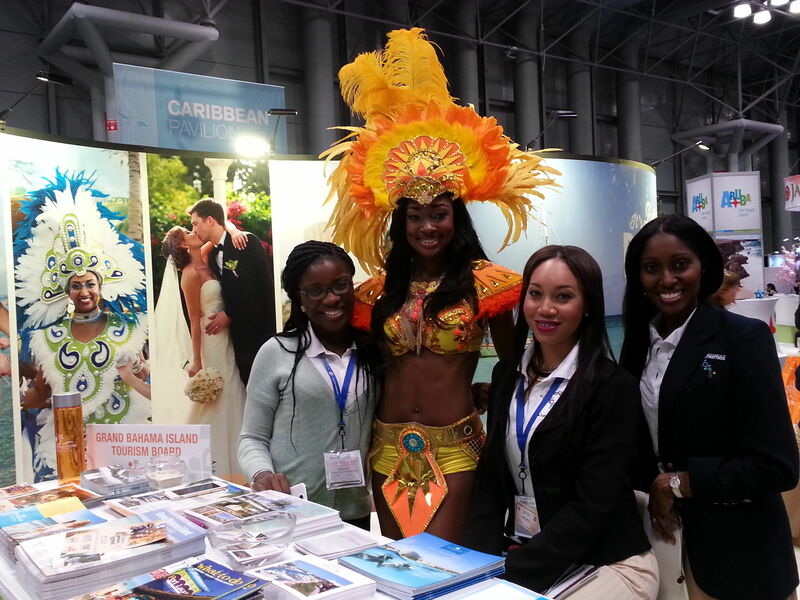 Islands of The Bahamas booth had a warm welcome for chilly New Yorkers at the NY Times Travel Show. As a destination, The Islands of the Bahamas is getting a lot of attention as a top Caribbean family beach vacation option this spring. So, at the recent New York Times Travel Show, we decided to find out more about what’s going on there. Chosen as one of the 2014 “Ten Best Caribbean Destinations for Families” by Parents magazine, the Bahamas is still winning awards and, now, offering deals. As of January 1st, 2015, the government repealed the country’s Hotel Guest Tax of 10% and replaced it with a 7.5% VAT, saving tourists 2.5% on their resort fees. Noted Tourism Minister, the Honorable Obie Wilchcombe, “We are determined to make a Bahamian vacation the best value for money in the world for a holiday.” We say bring it on! The best known family property, Atlantis on Paradise Island, became part of Marriott’s exclusive Autograph collection in the summer of 2014, giving families who are members of the Marriott loyalty program easy access to this resort. Atlantis is unique — an ocean-themed destination offering a variety of guestrooms in several towers, 40 restaurants and bars, a marina full of yachts that’s fun to tour, and a huge casino. Between the 141-acre waterscape comprised of fresh and saltwater lagoons, wild waterslides, tennis, golf, several mythical Atlantis underwater tableaux, a supervised club for ages 3-12, the summer Lego camps, big teens lounge and gorgeous beaches, you can’t go wrong (reservations: 954/809-2000). Right on the main island of Nassau, single parents and grandparents can take advantage of big savings at the Wyndham Nassau Resort. It has its own private white-sand beach, a kid’s club and a roster of headliner concerts that will thrill your teens. With their Kids Stay Free offer, guests are allowed to have up to two kids 17 and younger stay free of charge when sharing a guestroom with 1 adult in an Islandview or Oceanview category, and up to three kids 17 and younger if the one adult books a Corner Suite category. Restrictions may apply but it’s a good value and may be combined with all other offers. In a time-restricted offer, the Melia Nassau Beach on Cable Beach is having a three-day “Chinese New Year Event” from February 18-21, 2015. Families who book by February 17 and use the promo code: CNYPKG to pay $389/night per person for all meals, drinks and activities in their all-inclusive package, plus enjoy a special cocktail reception, fire show, Ribbon Dance, Unity Dinner at Nikkei and Chinese Karaoke to celebrate the Chinese Year of the Sheep. Call 800/336-3542 for reservations. Even if you’re not flying in for a land vacation, you can take advantage of all that Nassau resorts offer. Cruise ship passengers are invited to purchase a Bahamas Day Pass. This new shore excursion option allows passengers who buy online, before they arrive in the Bahamas, the chance to book a day pass to Atlantis or the elegant British Colonial Hilton for a fun-filled Bahamas shore excursion while in port. At the Atlantis, families can use all the facilities of the Aquaventure Waterpark from $135/day ($86 for ages 4-12, free under 4); if you want to book a dolphin encounter at Atlantis Dolphin Cay, that’s extra. The British Colonial Hilton day pass includes full access to the resort’s pristine private beach and pool, snorkeling and kayaking, lounge chairs and towels, plus a $40 food and beverage credit to use at their restaurant or bars. Bargain rates start at $60/adult including the $40 credit, and $30 per child who get a $20 food & beverage credit. Children 5 and under stay and play at the resort free. For more information and other value family beach vacation offers, visit Islands of The Bahamas official tourism site.